There is a huge push on the fringe of the Aikido community in regards to the founders Aiki and internal power. Now, before I go any further I want to state that I believe in many of the concepts that have been suggested, including those(especially those) relating to body connection and relaxation. I have also read with great interest in regards to those Shihan that may have inherited this “Aiki”. One that is put forward and validated by those that knew him was Koichi Tohei, 10th Dan and heir apparent to the technical Aiki of the founder. I have no doubt that Tohei was amazingly connected as a martial artist, but I have a different theory as to what it was that gave Tohei his amazing ability, this theory has been built up through transmissions from his senior student, instructor and one time heir, Koretoshi Maruyama, who coincidentally was a student of the founder of Aikido for 13 years. I posted the above quote for a particular reason, because hidden in plain sight secrets like Aiki have been promoted by men that have a vested interest in convincing you that what they do is what Ueshiba did(without actually knowing him by the way), and constantly accuse those that don’t possess what they have(or do) as not doing the founders Aiki. There is much evidence to say that, over time, the founders idea of Aikido changed. Shirata Rinjiro (who by the way, is a champion of the “Aiki”/IP crowd) stated in his interview with the late Stan Pranin of Aikido Journal that the founders Aikido changed after the war, as did Michio Hikitsuchi, 10th Dan. The founder himself left this cherry for us to chew on. 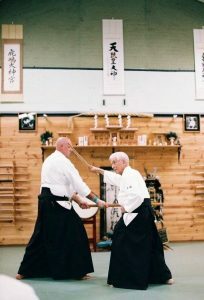 “As Ai harmony is common with Ai love, I decided to name my unique budo Aikido. Although the word Aiki is an old one. the word which was used by warriors in the past is fundamentally different to that of mine. I know this one has also been deflected by those who never actually knew the founder, but, it’s pretty clear what is being stated here. He has a new version of Aiki, one that doesn’t involve overcoming an opponent, one for not fighting, one that doesn’t destroy. I struggled with this concept for a while, until Maruyama Sensei (and I have since found out he is not the only Shihan giving value to this concept), mentioned the highest level of shinken shobu was represented by the concept of “ai-nuke”, mutual passing through, a fight to the death, where both combatants life was spared. Slowly the threads started to fall into place. I have stated elsewhere I am a student of history, it was my major in Uni, and has been a passion of mine my entire life. Now, the study of history is about creating, or recreating an idea by finding the common thread, looking at the evidence objectively from both, or all points of view, this if you will was my final piece of the puzzle to state my case for Aikido beyond all duality, based on the sword as the founder intended, and not on some ancient internal body function designed to defeat an opponent. The concept of ai-nuke comes from Mujushin Ryu(the sword school of no abiding mind) kenjutsu, who’s founder, Sekiun Goroemon Harigaya came to understand that the study of the sword for any violent purpose opposed the order of the universe, and so developed a sword style that had as its sole purpose, discovering, or more importantly, rediscovering the truth of no man, no sword, no opponent. Kenjutsu in the Mujuu style is not at all about winning and losing, beating or being beaten, in fact is not about conflict at all: it’s a flowing movement of breath, spirit and power. (Does this concept sound at all familiar). At its ultimate level, the study of the sword was about the study of the spirit of man, not about overcoming an adversary, but about overcoming ourselves(masakatsu agatsu, katsu hayahi…..Morihei Ueshiba). “the basis of true training is to forge the spirit(seishin no shugyo). Our primary purpose is to face our opponents without the slightest openings. Openings means: wishing to do technique on an opponent while avoiding their technique. Such a state of mind is delusional.. Maintain the principle of “no-mind” and you will lack nothing. This is a natural, marvelous principle. To not use discriminatory thought will result in absolute victory. Few were able also to follow the severe training(Shugyo) traditions layed down by Tesshu, including many of his students, but one, wishing to continue passing on the essence of what Tesshu had rediscovered in his sword school, but realising most normal men couldn’t endure such physical hardship, founded instead an organisation that became synonymous with Aikido Shihan, the ichikukai. Here is where this theory really starts to gather traction. 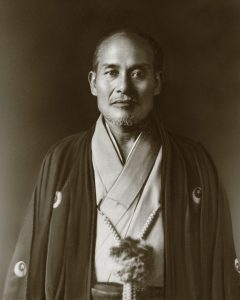 Famously, 10th Dan in Aikido, and apparent exponent of Aiki didn’t study Daito Ryu secret techniques at all, but rather, forged his mind at the crucible of Tesshu Yamaoka, and apparently also found within himself something of the concept of no me, no sword and no enemy, the concept that the founder of the ichikukai so desperately wanted to hand on to his students. The problem we have here is we are not talking about physical technique that can be taught to overcome an opponent, but rather, elevation of the spirit, so that one can begin to understand the unity of all things, Kiriotoshi the most important concept in itto ryu has as its foundation exactly this principle, one is all, all is one. Now, I know there will be those that will argue the point here, sure, no worries. But there are stories of Tesshu, who never studied Daito Ryu at all displaying easily such concepts as body of stone, or fudoshin body- immovable body, so there was some concept he gleaned from his years of arduous training that gave him such a power. I would say that no man, no sword no enemy gives one such an understanding. To unite the world of light, a body of flesh is given. Me, Ueshiba, I need to train more. (…) I can not show the way to people if I do not stand on the Floating Bridge of Heaven. I can only teach through practice. So we work on technique to elevate and become aware of spirit. Body and spirit together as a path to understanding and fulfilling our purpose as human beings, the very definition of unconditional love. Coming back to our concept of ai-nuke, it became a very important concept in Zen, so much so that Omori Roshi, under guidance from Daisetz SUZUKI spoke these words. “Harigaya Sekiun created the term Ai-nuke to describe his condition attained through sword. It is the world of ABSOLUTE PEACE THAT TRANSCENDS WINNING AND LOSING. (sound familiar again……). It is a different dimension from aiuchi. WE SHOULD CONSIDER IT A CRUCIAL TREASURE LEFT BY A MAN OF ANCIENT TIMES………………….you must transcend dualism and enter into the realm of Ai-nuke. It is no good just to INTELLECTUALISE the concept of Ai-nuke. Here we have mountain echo, another IP concept, reimagined by Shirata as a ki concept, so we start to get an idea of another of the founders concepts, ki-gata. Hard training in basic waza leads us to building an Aiki body. Study of the basic movement of the sword teaches us about our spirit, study and continuous practice of ukemi teaches us about death and rebirth, and also gives us a vehicle to misogi harai. All of these together, practiced daily, as the founder intended are tanren, the forging of the spirit through the body. And continuing these basics, such as suburi, kokyu ho and funekogi will lead you to a deep awareness of ai-nuke. Not one concept forsaken, not one moment wasted, a lifetime devoted to overcoming self. So let’s summarise . O-Sensei, a spiritual and martial giant studied many ancient forms of fighting and came to the conclusion that Aikido was a way to achieve spiritual awareness through hard physical training, this is backed up by another martial giant, Yamaoka Tesshu who came to exactly the same realisation. O Sensei was as deeply spiritual a person as his violent teacher sokaku Takeda was not. O Sensei and his Aikido were profoundly influenced by his spiritual practice, omoto kyo. O Sensei having studied Aiki under Takeda rejects his Aiki as just another way of fighting to defeat an opponent, and with sword in hand, hides himself away in Iwama, and discovers like Tesshu and Harigaya before him that the spirit of true budo is that of love, of oneness with the universe, of no me, no sword and no enemy. This realisation elevates his ability beyond Aiki. He chooses as his successor a man that also has been drilled in this concept, Tohei Sensei, who learnt these very concepts at the foot of the student of Yamaoka Tesshu at the ichikukai. That true Aikido is Ai-nuke, not fighting but passing through, not avoiding the conflict, but with the universe as his ally, controlling space and time, and conflict outside physical parameters. But that coming to such a realisation takes great work and sacrifice, death even, a willingness to sacrifice all to find this way. As I stated earlier, I do not reject the ideas that internal power brings to Aikido, the coordination of body that it takes to understand how these things work brings a strong understanding of how we function on a physiological level as efficient human beings, but I would argue that the concept of Aikido that the founder saw in his latter days had more to do with the concept of the spirit than that of an efficient body. “In the past martial artists were serious, their resolution was absolutely sincere, they worked soundly on technique and where neither daunted nor lazy. Such men believed what their instructors passed on to them, made great efforts day-and-night, tested their techniques, spoke with their friends about their doubts, mastered what they studied and awaken themselves to principles. For this reason what they acquired penetrated deeply within them. At first their instructors would teach them techniques but say nothing of the principles that were hidden within them. They only waited for the students to uncover those principles by themselves. And it’s not that they spoke grudgingly they simply wanted this students to use their minds and to master what they were studying in the interval. Disciples would thoroughly exert their minds and make great efforts. If there was something they understood on their own they would still go and confront the teacher; and he would acknowledge their understanding when their minds were in accord. This was the teaching method of the men of old. In this way the students were sure to be serious whether in scholarship or in martial arts. Now a days people are shallow and their resolution is not in earnest. They dislike the strenuous and love the easy from the time they are young. When they see something vaguely clever they want to learn it right away; but if taught in the manner of the old ways, they think it not worth learning. Now days, the way is revealed by the instructor, the deepest principles are taught even to beginners, the end result is set right out in front and the student is led along by the hand. Even with methods like these students become bored and many of them quit. In this way, talking about principles takes the high seat, the men of old are considered inadequate, mastery becomes watered down and students only make effort in things that might have them “climb to new heights”.